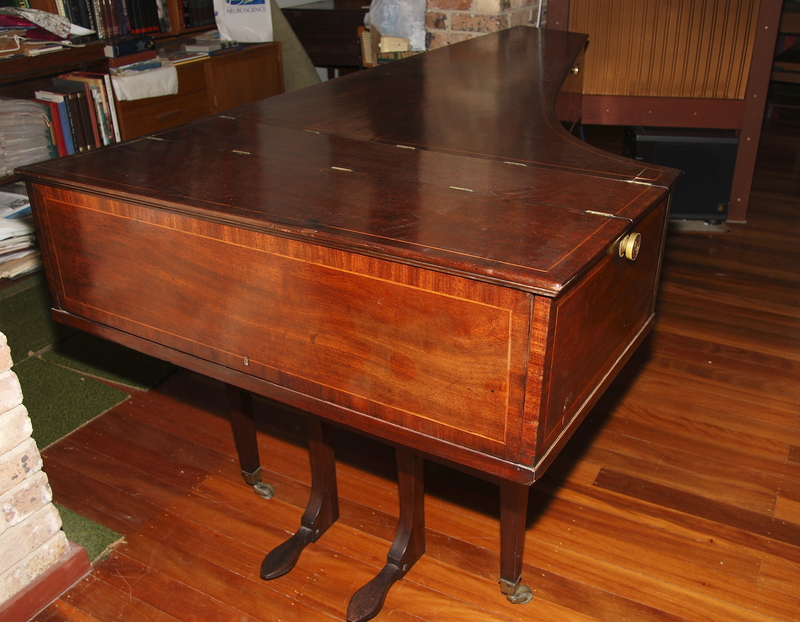 Clementi pursued a quintuple career as composer, performer, teacher, publisher and piano maker, having in 1800 taken over the firm of Longman and expanding it; on his death in 1832, the firm continued eventually as Collard and Collard, finally ceasing operation in 1971. This extremely rare instrument was specially strengthened for the Russian market, in which Clementi seems to have achieved a virtual monopoly. The Russians had always preferred English fortepianos to all others, and their own instruments were imitations of these; however, the instruments tended to dry out, become unglued and fall apart in the superheated Russian interiors. Clementi, ever a resourceful businessman, made three trips to Russia, selling his grands especially reinforced with external brass corners to combat this contingency; such an instrument was supplied to the composer Glinka. The present instrument, probably the only surviving “Russian model”, was the property of the British ambassador to St. Petersburg, who decamped with all his goods and chattels at the time of the Napoleonic invasion. From that time (1812) until a few years ago, it reposed forgotten in an attic in the family manor house in Ireland, and was there discovered by well-known dealer and collector, Mr. William Bradshaw. It is tempting to imagine Clementi standing by while his apprentice John Field demonstrated this beautiful grand to His Excellency.